Sharon Lafaye Jones (May 4, 1956 – November 18, 2016) was an American soul and funk singer. 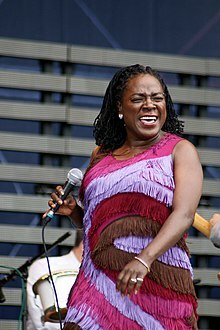 She was the lead singer of Sharon Jones & The Dap-Kings, a soul and funk band based in Brooklyn, New York. Jones died on November 18, 2016 in Cooperstown, New York of complications from pancreatic cancer, aged 60. ↑ Ryzik, Melena (April 23, 2010). "Music: Playlists. Sharon Jones and Neal Sugarman. From Jameson to Fela Kuti, Preshow Rites of a Soul Band". New York Times. Retrieved September 15, 2015. ↑ sharonjones (November 18, 2016). "We are deeply saddened to announce Sharon Jones passed away today. More details at sharonjonesandthedapkings.com" (Tweet). ↑ "Big-voiced Dap-Kings soul singer Sharon Jones dies at 60". Chicago Sun-Times. November 18, 2016. Retrieved November 19, 2016.